It’s a nasty world out there and once your signal pins stray outside the warm cosy environment of you design they better be protected for there own good. In any electronic circuit the bulk of interconnections are between devices on the same circuit board and don’t require any further attention. However, some signals, normally inputs and outputs will be directed off the board to another circuit or sensor. 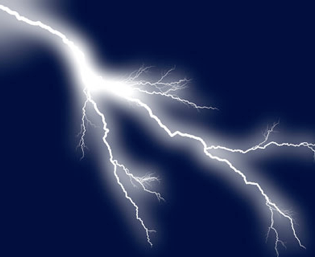 It is these connections that are vulnerable, and can be a route for circuit damaging signals, transients and static discharge to get into your system. At best this can make you circuit malfunction, at worst it can permanently damage your electronics. This is a vast topic and if you are making anything commercially there are legally binding regulations to be complied with in this respect. Here, I just want to look at a few techniques that can be useful in preventing damage in a typical hobbyist / art installation. 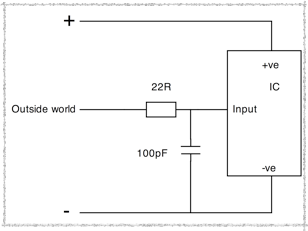 It’s a golden rule in electronics, any input voltage applied to a device has to be within that device’s power rails. It it is not then you risk damage being done. In most ICs there is what is know as internal protection diodes that will provide some degree of protection but they are insufficient to provide all the protection you need and sometimes they need a bit of help. In order to help limit the current for the built in protection you should put a low value series resistor. Also if the signal input will stand it put a small capacitor. This helps to absorb sudden transients, as found in static discharge, but it can degrade the signal especially if it is fast. The faster your signal the smaller capacitor it can stand before degrading the signal and the less spike protection you have. If there is any real signal that could go outside the power limits the internal protection is not sufficient and you would have to protect against over voltage using a pair of signal diodes, known as supply clamping diodes or catcher diodes. These go from the input to each supply rail. It is important to keep the series resistance in to have something to drop the voltage over, this limits the current. The series resistor value of 22R is adequate for protection against static discharge because static charges, despite their high voltage, do not have too much energy in them. If you have an input that you know regularly goes outside the supply limits then make the series resistor higher. Something like 100R to 200R should be sufficient to keep the current down. If the value is too high then you won’t see a proper logic zero level. There are more techniques like using verisistors, it’s a concatenation of “voltage variable resistor” These are components that normally look like insulators but, break down and conduct with a low resistance when their rated voltage is exceeded. Also small inductors or chokes are used to limit fast transients. One simple way to remove high frequencies from a lead is to wrap it for several turns through a ferrite ring. This has the advantage of leaving the lead unchanged, but it is normally effective only against radio frequency pickup. Commercial equipment is tested by deliberately putting large voltage surges and rapid voltage spikes into the system, these can be several thousand volts in size, and protection against this can be a lot more demanding. Note the top diode will start to conduct when the input goes above the +ve rail and the bottom diode will start to conduct when the input goes more negative that the negative rail. This might not seem important at first but if there is anything capacitivly coupled into the input (that is connected with a series capacitor) then negative spikes are generated when a square wave is passed through it. 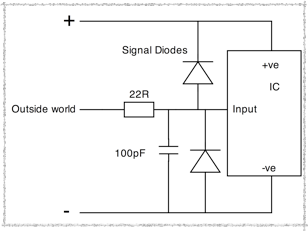 The diodes don’t have to carry much current so ordinary signal diodes are sufficient. This is such a common solution that there are components consisting of two diodes in a single package wired up like this. Look up the popular BAV99. However I have also seen a single diode used for this sort of protection. 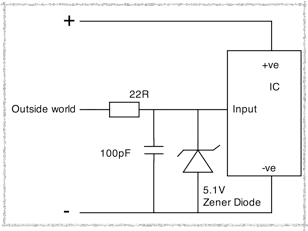 By using a Zener diode that conducts at as close to the input as you can you get both the positive rail and negative rail taken care of in the same component. This is not as good as the two diodes because it relies on the slope of the Zener being sharp. However, it is a good technique when you want to limit voltages to values outside the supply rails either greater than or less than.